Quick, easy, wholesome…breakfast in a snap! Grind almonds, walnuts, pumpkin seeds, flaxseeds, sesame seeds in a coffee grinder or food processor until they resemble coarse crumbs. Put ground nuts and seeds in a bowl. 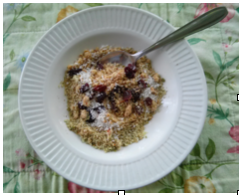 Add hemp hearts, coconut flakes, raisins. Add 1/2 cup hot water to nut blend, stir and eat.